Machining timber products has certainly come along way in the 25 years we have been designing and creating bespoke exciting fun play areas. Soon to arrive at our factory will be a SCM M200 5-axis machining centre which will provide us with the unique capability to machine solid wood and laminated timbers up to 6m long by 1.600m wide with a depth of 250mm in 3D. From solid wood spring mobiles, carved themed play equipment to totem poles and 3D wooden products we can deliver. Our design team are currently creating products in solid wood using age old techniques providing the feel of hand crafted features but delivered at the fraction of the cost. 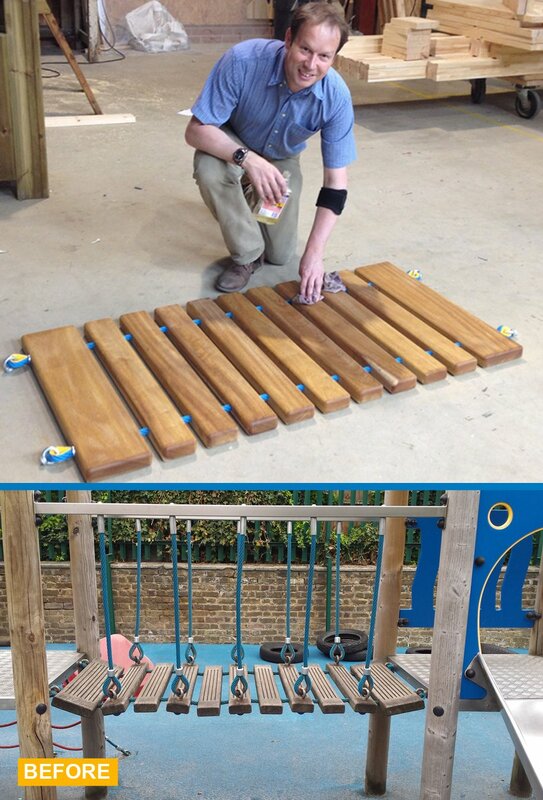 We’ve been rather busy at Online Playgrounds and its all hands on deck! So much so, we have Andrew our Managing Director back working in the factory. At OLP, we specialise in replacement parts to enable our customers to maintain their playground equipment to a high standard and at an affordable price. A good example is this replacement Suspension Bridge manufactured in house using steel core combination rope and iroko. NEW Online Playgrounds Brochure for 2014! The team at Online Playgrounds are delighted to announce the launch of our new 2014 Commercial Playground Spares Service Brochure. We have monitored sales, favourite products and missing essentials to complete a comprehensive stock of spares for your project. In this convenient 68 page colour brochure, we have accommodated for the diverse market in playground spares in a handy A5 format. New products include 3 New Birds Nest Swings, the launch of the Surfer Spring Rocker, new ranges in Platform access ladders and the addition of Rubber Mulch Repair Kits in our Surfacing Repair section. We now also offer, from stock, products required to carry out repairs to Skate parks including: pre-drilled Skatelite, Rivets and Rhino Board. We have included a wealth of information in the brochure but please do not hesitate to contact us for parts clarification and advice. Our technical team will be happy to assist. Call or Email us for your free copy! 01354 638 193 sales@onlineplaygrounds.co.uk.